The Aquarium's teen diving expedition Sea TURTLE is reporting live from Rhode Island. This post is from Catherine. Today was filled with field studies, scuba diving and the affirmation of the fact that I was in awesome company. “So here’s a joke, Helium walks into a bar, and the bartender says, ‘We don’t serve noble gases here.’, the helium doesn’t react.” When a joke like that receives a bout of laughter in return, you know you’re surrounded with fellow science lovers. Here, there is no limit to just how nerdy you can get. Want to make a joke about having an air bladder? Go ahead! Want to shout out scientific names and terms while jumping off a dock? Everyone will join in! There really is no better feeling than to be surrounded by those with the same passion for science and knowledge that you have. 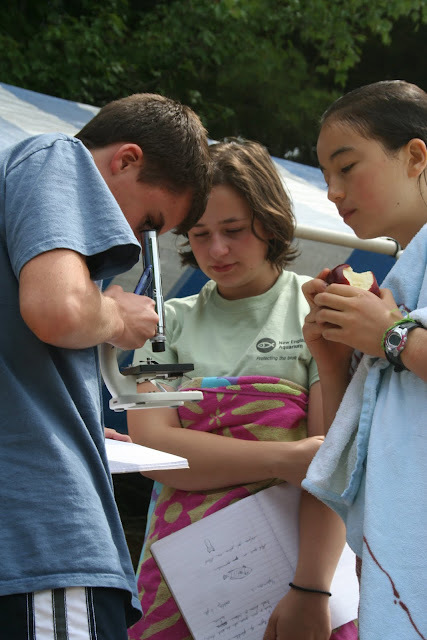 Then as a group, you can combine all of your excitement and love for science and use it while you’re conducting population counts or thinking of stewardship projects or examining plankton under microscopes. Being surrounded by such dedicated, wonderful, invertebrate loving people makes everything fun. One of the most memorable moments of the day for me was trying to catch a fish using a seine net (a net with weights on the bottom). A few people grabbed onto the net and started bringing it towards the shore. While people brought the net towards the shore, one or two people tromped through the water like wild beasts, scaring the fish towards our waiting net. Eventually we caught a fish and identified it as a blue gill. We then spent the rest of our free time snorkeling through the water and running from horse flies. All in all, today was an eventful, wonderfully nerdy day. The Aquarium's teen diving expedition Sea TURTLE is reporting live from Rhode Island. This post is from Isabelle. After lunch group two geared up and got ready to do their last certification dive, while we stayed on shore to do science. The mission for the afternoon was to compile a list of all the species we could find, both marine and terrestrial. The competition was on to see if we could find more species than the other group had found during the morning. We thought doing a plankton tow would give us a competitive advantage, until we realized that there were so many comb jellies in the water that they clogged our net and didn’t let any of the water out. Other identification methods included snorkeling and tide pooling. Isabelle and Brendan take a midday blogging break. Earlier in the day we had made a new friend when he wandered over to check out the lion’s mane jelly that Shosh found in our dive site. His name was John and he worked for Biomes, a marine science education center here in Rhode Island. He was snorkeling looking for baby tropical fish that had been swept up the coast by the Gulf Stream. John invited us to do some seine netting through the eel grass beds to see what we could find. Watch out for those tentacles! 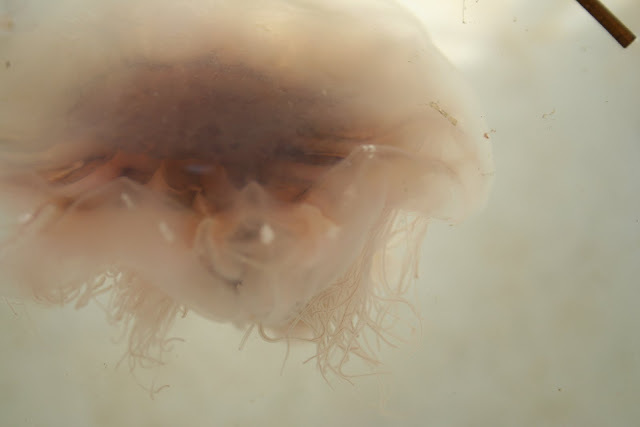 Here's a closeup of the lion's mane jelly that we collected for the Biomes Center! The Aquarium's teen diving expedition Sea TURTLE is reporting live from Rhode Island. This post is from Ming. I can’t believe it’s day three of the expedition already. Today, in our first ocean dive, we finally got certified! After a 40-minute drive filled with Dave’s science playlist songs (think “We Are Made of DNA” and “Monkeys Versus Robots”), we unpacked and suited up to complete our final sets of skills: complete mask removal, hovering with both bcd and oral inflation and CESA. The water was, surprisingly, not that much colder than the pond, but the visibility was pretty much the same; the cloudy/sandy water and foggy goggles didn’t help. Midway through our 20-foot descent, I could not see either the bottom, the surface or the buoy line a few feet in front of me. People were cloudy black silhouettes that I had to squint at to see. Especially during the buoyancy exercises, I didn’t realize I was slowly rising, or moving at all, until I saw the sky directly above me through the water. But sure enough, by the end of the dive, we were PADI certified! It definitely took a while to sink in: we could now go anywhere, anytime, and dive there. 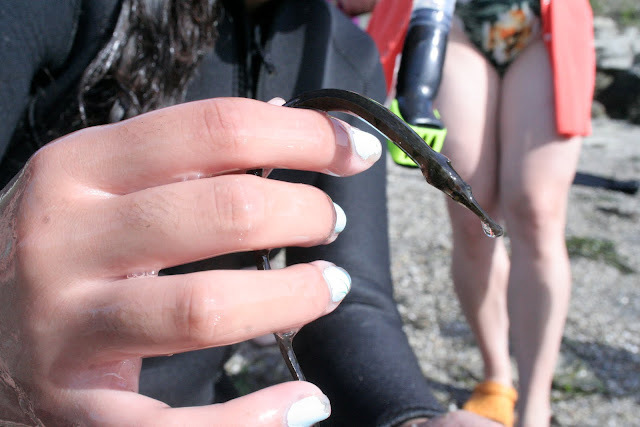 A pipefish! 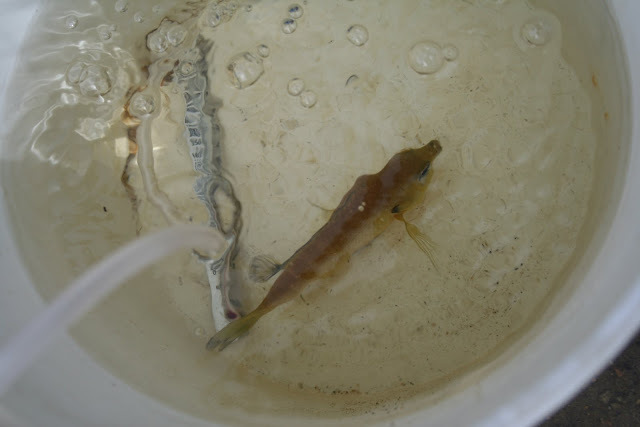 Just one of many marine species we found today! Then, as certified divers, we scuba-d along the shore and were given free time to admire the totally seaweed covered rocks and their fishy and crabby inhabitants for the rest of the dive. Another day at the pond! The Aquarium's teen diving expedition Sea TURTLE is reporting live from Rhode Island. This post is from Kaitlin. 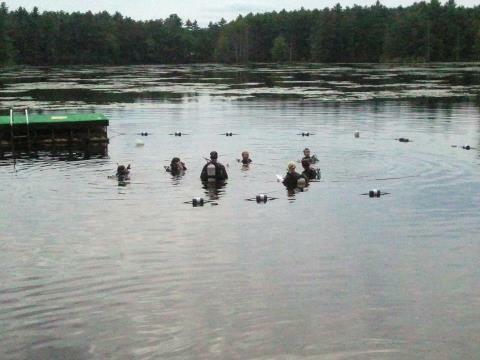 Today was more pond diving! But instead of just doing surface skills, we were going underwater, which was really challenging considering there is almost no visibility! It was so much different than the pool and definitely took some getting used to, but once we conquered it everyone felt so accomplished! The most challenging part was definitely the compass navigation. The darkness engulfed everyone as we headed out deeper into the water. Under the water, the bottom twisted everyone up in muck, and the compass seemed to be leading you in the wrong direction. But once you decided, alright, I’m going to trust this compass, when you got up to the surface in the right area; the relief was instant and very rewarding. All in all, the day of diving was long but incredible! It was definitely a good precursor to the ocean tomorrow. The Aquarium's teen diving expedition Sea TURTLE is reporting live from Rhode Island. This post is from Elana. Today at 10am we piled our bags into two vans and departed for Rhode Island. 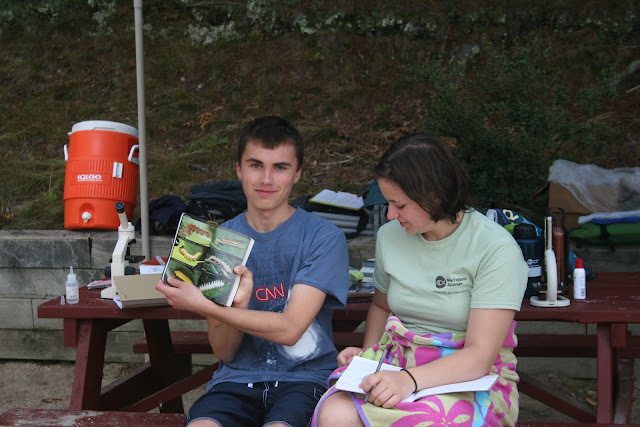 We grooved to Dave’s science playlist, while playing 20 questions: science version, until we finally arrived at the camp. After a quick lunch and a short walk to our cabins we were excited to get the expedition started. The girls raced to choose bunks while the boys lounged in all the space of their cabin. After quickly changing and unpacking a little we piled back into the van to head to the pond. We were all thrilled to finally be able to get into the water and not just for the fun of it. We realized how hot it can get while wearing a long sleeve wetsuit in the heat of a summer day. Soon we were all in the water, some with BCD’s and tanks going over important skills while the other half looked at fish and took pictures of each other jumping off the floating dock. Then it was time to switch. Before we knew it, it was time for a delicious dinner served at the dining hall. After some free time and the anticipation of a campfire and s’mores, we cannot wait to see what the day holds for us tomorrow! The Aquarium's teen diving expedition Sea TURTLE is reporting live from Rhode Island. This post is from Leah. We started off our day at the Aquarium, learning about fishes; about body shapes, sensory organs, fins, we drew both flounders and skates, and then talked about environmental stewardship. For those of you less involved in the ocean-protecting world, stewardship is the commitment to protecting something. In this case, it’s our commitment to protecting our oceans. We talked about ways we could help protect our oceans. After a lovely educational morning we made our way to the MIT pool, by the train. At the pool we worked on different essential scuba diving skills, necessary to gain our eventual scuba certification. Even though a lot of us (me included) struggled with perfecting some of our skills, with support from our fellow Sea TURTLEs and instructors, we managed to get everything accomplished! After one more day, and a week break, we’ll go to Rhode Island to continue our majestic journey. I’m excited! Sea TURTLEs in Rhode Island? There are many possible reasons why you may be reading these words today. 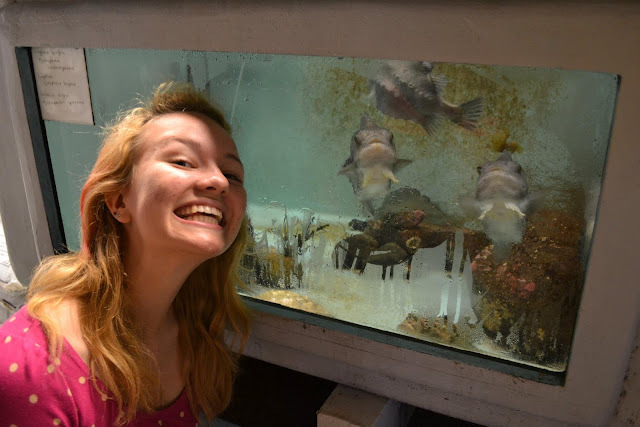 Perhaps you were perusing the Aquarium’s website and stumbled across this blog by accident. Maybe you clicked through from Facebook or Twitter. 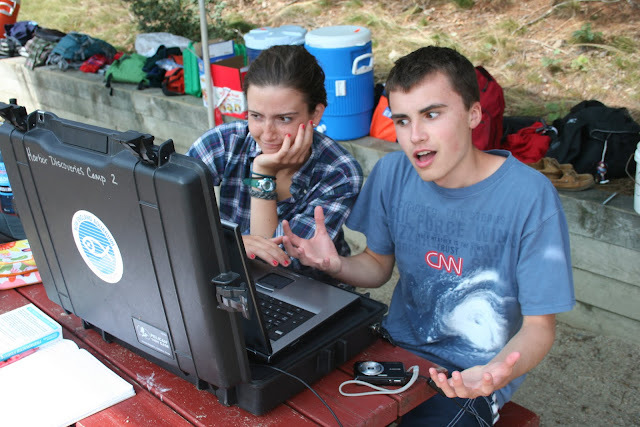 Or maybe you were searching the web for teen scuba programs and this was one of the results. There is even an off chance that you know a teen in this program and want to see how they are doing. No matter why you are here, welcome to the blog of the New England Aquarium’s Sea TURTLE (Teen Underwater Research Training and Learning Expedition)! 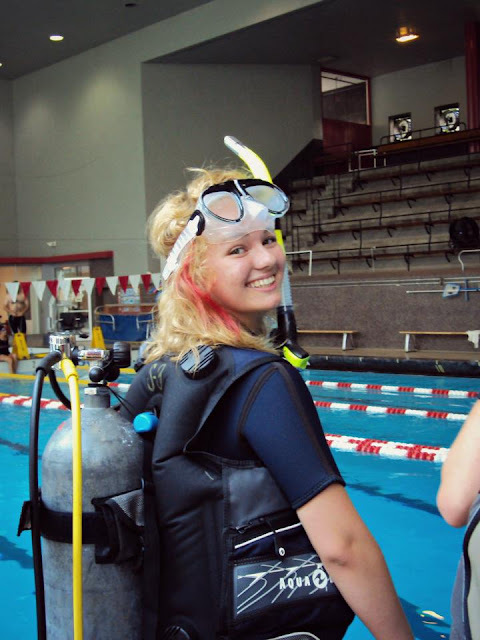 Sea TURTLE is a program for teens of diverse backgrounds to learn how to scuba dive, live and work as a team, promote ocean stewardship and dive deeper into marine science. 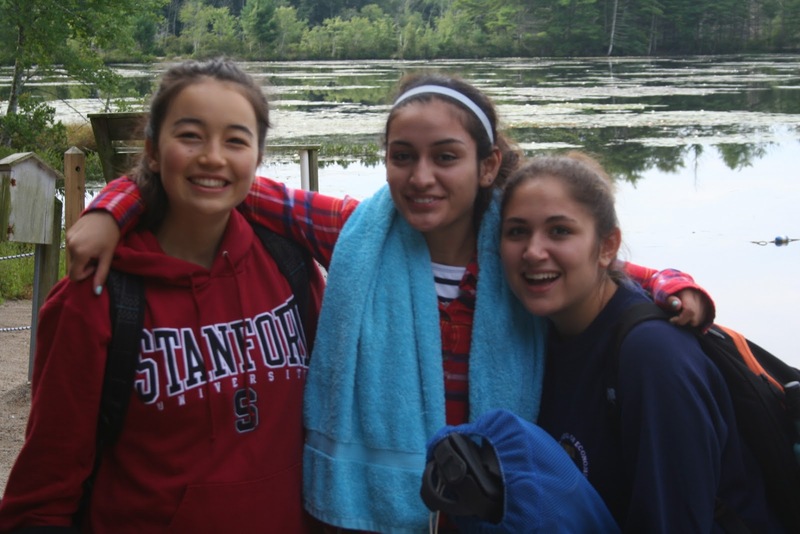 This year, teens and staffers will be spending a week in Boston for classes and pool sessions followed by a week camping and diving in Rhode Island. 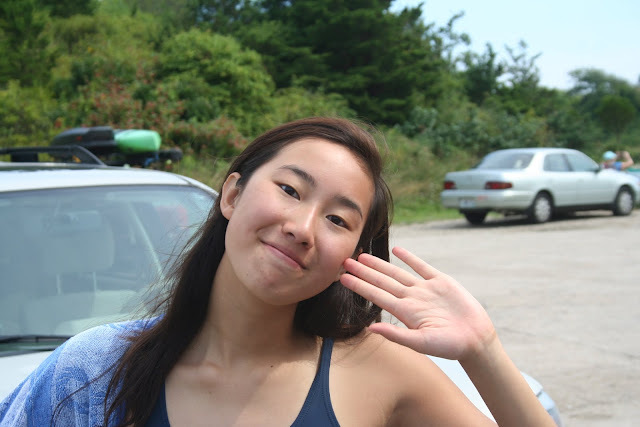 Since all of our teens come from a coastal New England state, it’s exciting to learn about and see firsthand local marine species and habitats. Yet this expedition is only half the program. Our Sea TURTLEs were selected from a very diverse and dynamic group of teens. Just to become a Sea TURTLE with the New England Aquarium, teens filled out applications, wrote essays and participated in two interviews (one group and one individual). If that sounds like a lot of work, it is! It takes both desire and commitment to be a TURTLE! We invite you to follow along and share our adventures with us! Along the way, you will get a chance to meet (and learn from) our 13 amazing teens. And perhaps you will find a little inspiration in our blog for your own marine science adventures this summer!